Fish Window Cleaning’s “Fishing Report” – Winter 2012 Issue has arrived. The “Fishing Report” is a quarterly magazine written and produced by Fish Window Cleaning’s Corporate office to keep franchisees and customers updated on the latest news in the Fish Family. 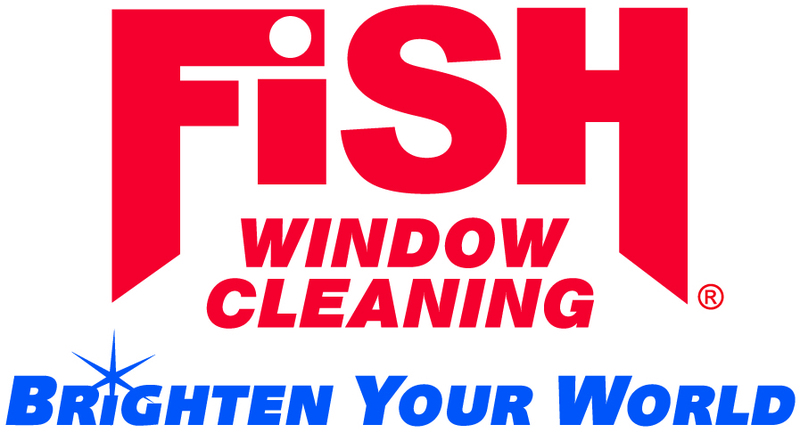 Fish Window Cleaning is America’s Largest window cleaning company, and reports that Fish Franchisees cleaned 40,000,000 windows in 2011. 2011 Another Banner Year for FISH! Pictures of Fish Franchisees - Who do You Recognize? FISH is celebrating it’s 34th Anniversary and is made of good people, doing good work. 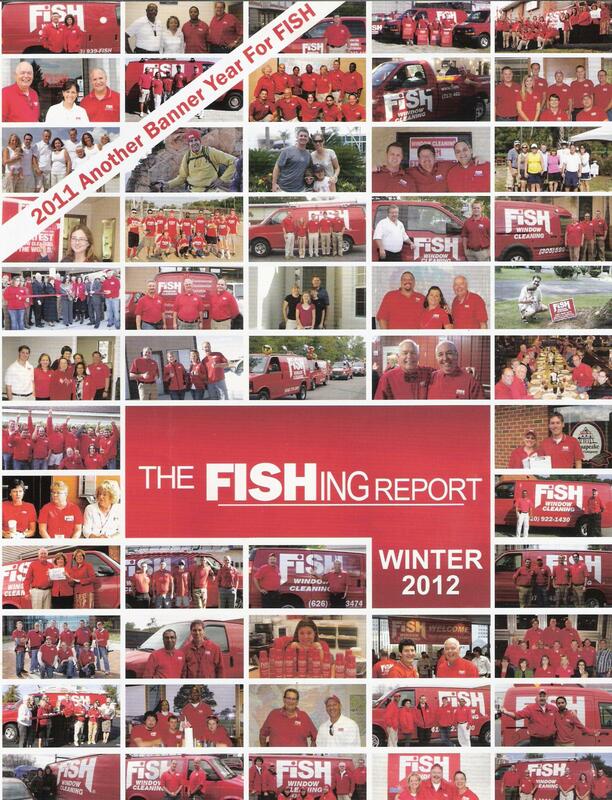 The Fishing Report – Winter 2012 issue features 50+ photos of Fish Window Cleaning franchisees from around the country. Franchisees are encouraged to submit pictures of their teams & Red Fish Vans and every time there’s a regional meeting or a District Manager visits a location – pictures are taken and shared. To check out more Fish photos, visit our Online Photos – Fish In Action. Request: Click on the Fishing Report Cover – Do you see someone you recognize? If so, please leave a comment and tell us who you see! Fish had a great 2011, here are some of the highlights! 2012 is looking even better! Stay Tuned! Please welcome our newest additions to the Fish Family. Contact them, they’ve launched successfully and are making windows SPARKLE! Welcome Aboard! Now let’s go clean some windows! The Fishing Report is loaded with information about Fish Window Cleaning. New FISH Franchisees – Fish has added 9 new Franchisees since the last issue! Get Your Fishing Report Today! If you would like a copy of “The Fishing Report” please contact GeGe Mix at Fish Window Cleaning Headquarters at 877-707-3474. Also, each local franchisee receives 5 copies and we are happy to share them. We can hardly wait until the next issue… Go Fish! The “Fishing Report” has arrived! Fish Window Cleaning’s “Fishing Report” – Fall Issue has arrived. 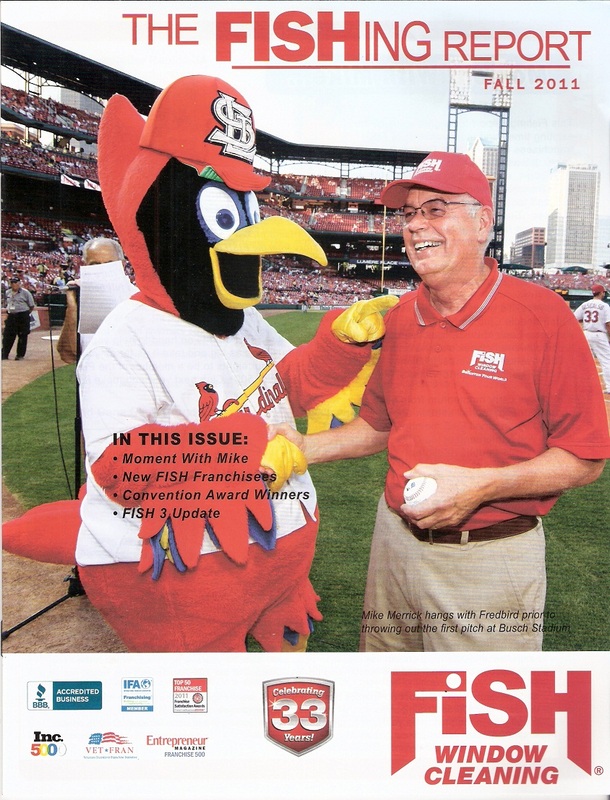 Mike Merrick and "Fredbird" on the Cover of Fish Window Cleaning's "Fishing Report - Fall 2011"
On the cover, Fish Window Cleaning founder and CEO, Mike Merrick, meets with FredBird prior to throwing out the first pitch at Busch Stadium in St. Louis. In July 2011, Mike Merrick threw a strike prior to a regular season game for the World Series Champions, St. Louis Cardinal’s to kick off the annual Fish Convention. New FISH Franchisees – Fish has added 16 new Franchisees since the last issue! If you would like a copy of the “Fishing Report” please contact GeGe Mix at Fish Window Cleaning Headquarters at 877-707-3474. Also, each local franchisee receives 5 copies and we are happy to share them.